Author: Thom, James Alexander Set In . . . Description: In a monastery built by Franciscan monks on the site of an Aztec war god’s temple, a rogue battalion of cannoneers prepares to make its final stand along a strategic road to Mexico City. 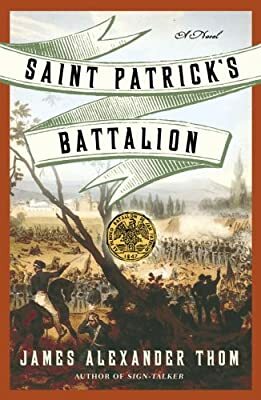 Reviled by its enemies and lionized by its allies, Saint Patrick’s Battalion will fight under an emerald green flag with the fury of the proud and the damned. And as James Alexander Thom’s extraordinary new novel reaches a shattering climax, the reader hurtles into a collision between true loyalty and true betrayal–and between the best and basest reasons for war.